A new study commissioned by the Lifesaving Society, Canada’s leading organization responsible for drowning prevention, has found tweens (aged 11-14) who are new to Canada are five times more likely to be unable to swim than their Canadian born classmates. The study also found that despite this, 93% of new Canadian tweens say they participate in activities in, on or around water. The new study, “The Influence of Ethnicity on Tweens Swimming & Water Safety in Canada” was conducted to better understand the attitudes and behaviours of Canadian tweens around swimming and water safety, both new Canadians and those born in Canada. The study builds on important research commissioned by the Society in 2010, which found that new Canadian adults were four times more likely to be unable to swim than those born in Canada. Results suggest that water safety risk is higher for new Canadian tweens than those born in Canada; and even more so for tweens who have been here for less than five years, who are up to seven times more likely to be unable to swim than those born in Canada. 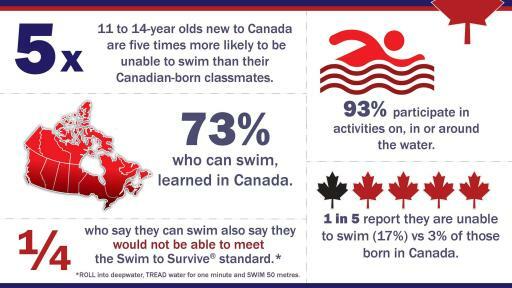 68% of new Canadian tweens identified swimming as an activity they participate in vs. 90% of tweens born in Canada; however, nearly one in five (17%) of new Canadian tweens report they are unable to swim vs. 3% of those born in Canada. Another one in three (34%) say they can only swim a little vs. 10% of those born in Canada. Many new Canadian tweens who can swim aren’t confident about their abilities. One quarter of new Canadian tweens who say they can swim also say they would not be able to meet the Swim to Survive standard of “jumping into deep water at a pool, supporting themselves on the surface for 1 minute and then swimming 2 lengths of a community pool”. Many new Canadian tweens also worry they might drown or get injured while swimming (49% of new Canadians vs. 21% of those born in Canada). Many new Canadians come from countries where learning to swim and water safety are not part of their experience. When they come to Canada, a country with an abundance of fresh water and opportunity for water-based activities, they often want to embrace the quintessential experience of swimming. The research shows that the majority (73%) of new Canadian tweens who can swim, learned in Canada. 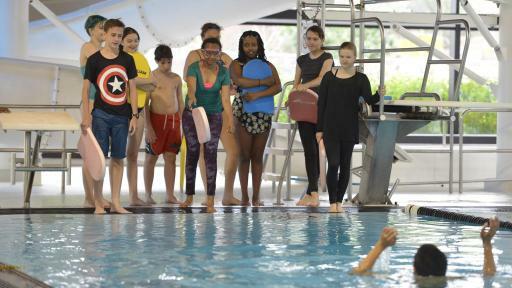 The Lifesaving Society’s Swim to Survive program is a school-based program for Grade 3 students, which teaches three basic skills in sequence: roll into deep water; tread water for one minute; and swim 50 metres. 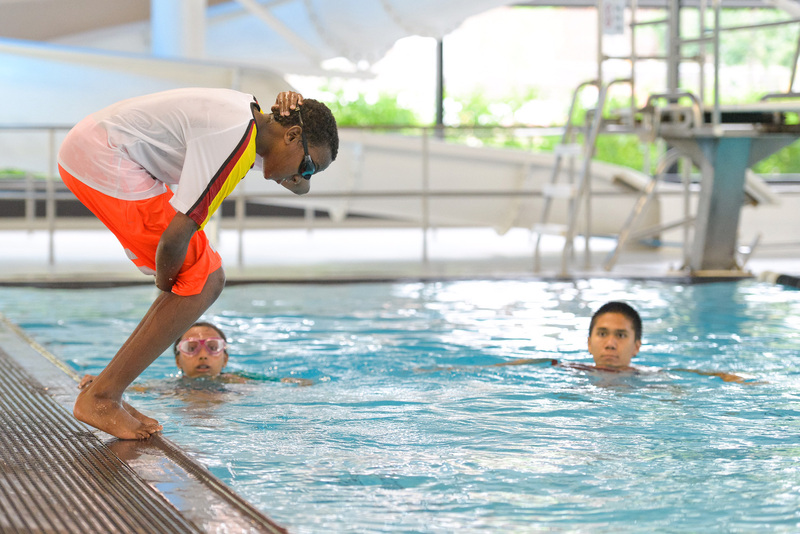 While not a replacement for standard swimming lessons, the program is an important first step to being safe around water, and could make the difference between life and death when immersion in water is sudden and unexpected. Swim to Survive+ which targets the tween demographic (Grade 7 students) is also offered in partnership with schools, and teaches the basic swimming skills needed to survive a fall into deep water and how to safely assist a friend. The program is offered during school time and allows students to participate wearing regular ‘street’ clothing. Both Swim to Survive and Swim to Survive+ were developed with support from founding sponsor the Stephanie Gaetz KEEPSAFE Foundation. Since 2005, funding from the Ontario Government - Ministry of Education has provided more than 755,000 Grade 3 students with the opportunity to learn the Swim to Survive skills. Since 2013, more than 40,000 Grade 7 students have participated in the Swim to Survive+ program. Swim to Survive+ is currently funded by the Ontario Trillium Foundation and PPL Aquatic Fitness & Spa Group. In response to community need, the Lifesaving Society has recently introduced Family Swim to Survive. 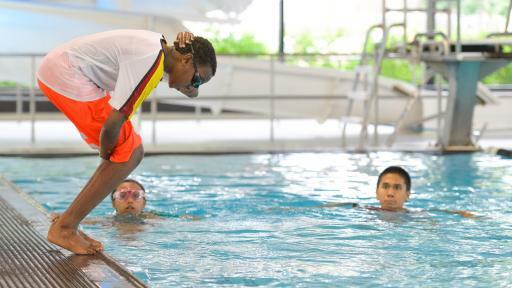 This new program enables participants to learn the Swim to Survive skills together as a family. A number of municipalities in Ontario are offering the new program. The learnings from this research study, funded by the Ontario Trillium Foundation will help the Society to continue to improve programs and communications to help keep all Canadians water safe. 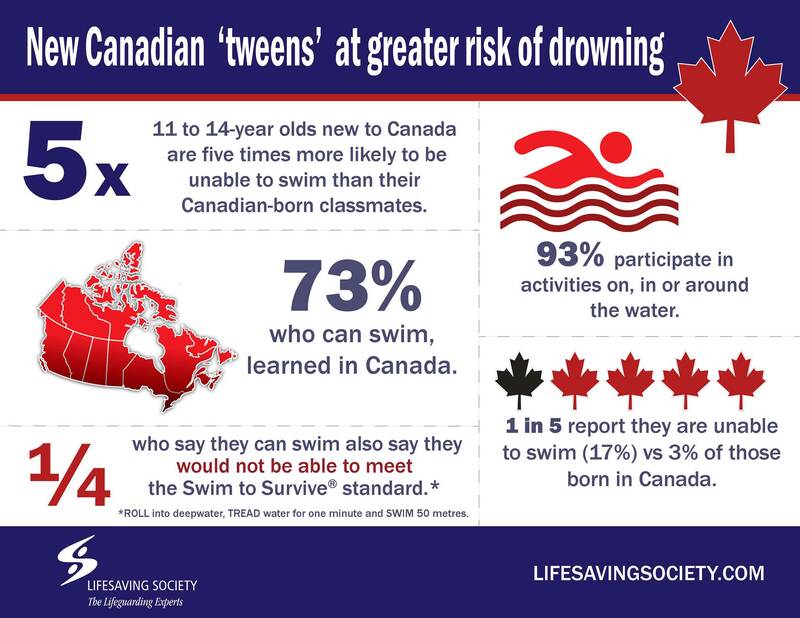 The study “The Influence of Ethnicity on Tweens Swimming & Water Safety in Canada” was commissioned by the Lifesaving Society to better understand the attitudes and behaviours of Canadian tweens around swimming and water safety, including both new Canadians and those born in Canada. The study focused on a population of respondents born in Canada and respondents from the Chinese, South Asian, Southeast Asian, and Middle Eastern and Muslim communities who were not born in Canada. The data were collected between March 29th 2016 and April 18th 2016. The total sample was 657 Canadian residents between the ages of 11 and 14. Of the total respondents, 297 were born in Canada and 360 were not born in Canada. They are referred to as ‘new Canadian tweens’ throughout the news release. (Results of a probability study with a sample size of 297 are considered accurate within +/- 5.69 percentage points, 19 times out of 20. Results of a probability study with a sample size of 360 are considered accurate within +/- 5.17 percentage points, 19 times out of 20). The study was conducted on behalf of the Lifesaving Society by Gadd Research and McCullough Associates. Gadd Research is a Toronto-based market research company established in 1989. They specialize in qualitative and quantitative market research with a focus on in-depth insight into consumer attitudes and behaviours. Swim to Survive teaches Grade 3 children three basic skills in sequence: roll into deep water; tread water for one minute; and swim 50 metres (statistics show that most people who drown are less than 15 metres from shore or safety). Swim to Survive+ builds on the skills taught in Swim to Survive and is geared towards presenting real-life situations for children in Grade 7. Participants learn to complete the skills with their clothes on and how to safely help a friend. Family Swim to Survive enables families to learn the Swim to Survive skills together. Those interested are encouraged to contact their local pool or visit www.lifesavingsociety.com for more information about Family Swim to Survive.